Watercress Nasturtium officinale is one of my favorite plants to grow in the waterfalls and pond for two reasons. 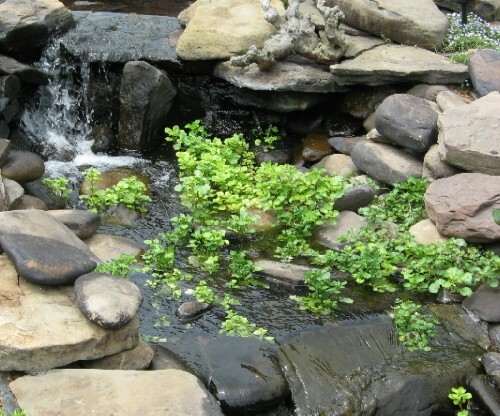 First if it is grown in the waterfall it will quickly cover the stones with a mass of small green leaves that will keep unsightly algae from growing on the stones. The second reason I like to grow the Watercress is when it starts to grow out of its bounds then I pull handfuls out and feed it to the fish. And it is good for them! 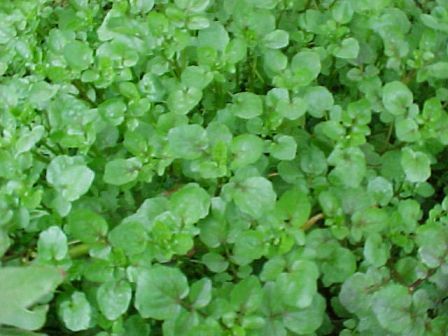 Watercress loves moving water so be sure to place it where the water is moving for sure success. What I do is I lift a stone and tuck the roots under the stone. I will also tuck some in the nooks and crannies of the stones near the side stones but where the water will still flow past the Watercress. Soon it will start growing and spreading out to cover all the stones. If you don’t like the stones totally covered, then simply remove some for fish food. This plant can be potted, or the rooted ends tucked into the rocks of a streambed or water fall.